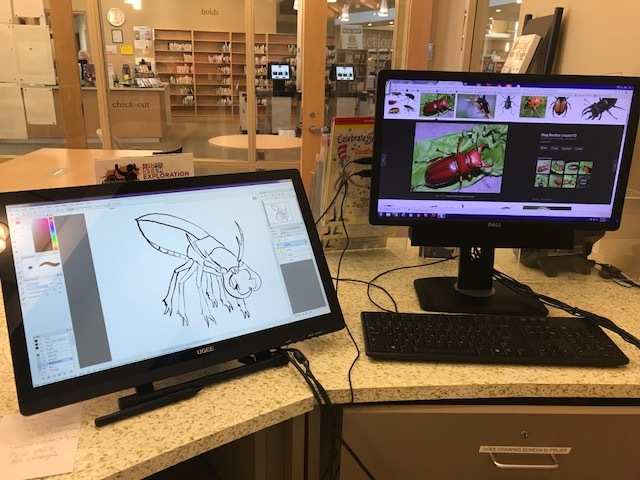 A drawing tablet is a computer display that allows the artist to draw images, animation, and graphics with a stylus pen. We have a UG-2150 drawing tablet equipped with a pressure sensitive pen and a wide variety of freeware creative tools. Sign up now to earn the drawing tablet badge. Earning the Drawing Tablet badge allows you to reserve the Drawing Tablet to create your own projects in the MakerLab. In exchange for use of the machine in the lab, you also agree to also share information about your project with curious customers.